Electronic Cities is an A/V digital installation trying to mimic the different ways of designing urban landscapes. Inspired by Tsutomu Nihei’s cyber punk manga «Blame!» in which cities are built almost by themselves, Electronic Cities is an algorithmic’s ode to self-building cities. It is also a critic of how Humans are building cities today. Sometimes chaotic, sometimes very straight and geometric, the piece evolves by following a very basic set of rules. 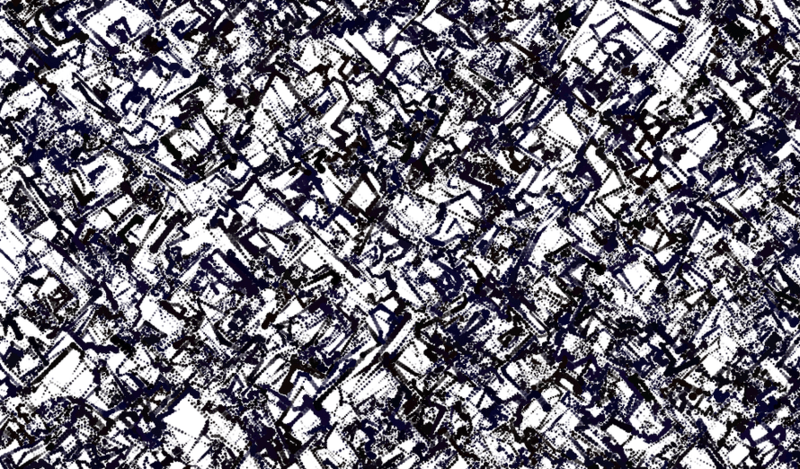 These rules evolve themselves to make the piece evolving everytime and generating unique artworks, unique algorithmic-designed cities. Sometimes, cities die and let the whole screen blank. Then, another city can grow. Each x second, the installation saves a snapshot of the screen and push it on a picture services on internet in order to directly and automatically shows how the city was at this precise moment. This is also a short metaphor about the information propagation: audience on site can watch, but at the same time, every one in the world can watch it too. Sound layer is very important in urban territories. Electronic Cities produces sound, using sometimes samples of urban field recording moments or pure synthesis and raw/glitch sound waves. Every change and sound evolution depend on the artwork, the visual itself. This is also a way to hear the visuals, to hear the cities’ design while it occurs. Interactivity is one of the next step of the piece. By using Social Network feeds, local area networks or PAN (bluetooth), audience would be able to modify each generated piece. Electronic Cities can be run in multiple places on Earth and at the same time. Each digital installation can communicate with the other by using Internet. The whole network can share design parameters, sounds and visuals themselves to produce a monumental and network-based piece. Depending on the different number of galleries and places exhibiting the piece, this system will or won’t be able to also generate multi-channel sound matter. Algorithms are ready, but chaos itself needs to progress all along submissions, lectures and courses in order to make this art piece evolving.